The following terms and conditions apply in relation to contracts with Taxi Transfers Pinheiro for transfers from/to Faro Airport. We are committed to protecting your privacy and security. All personal data that we collect from you will be processed in accordance with Portuguese Data Protection Authority. Our company is fully insured, having all the insurances requested by the Portuguese law. All transfers contracted with Taxi Transfers Pinheiro are private transfers, it needs that you don´t share the vehicle with other travelers. Modifications to booking must be made 48hrs prior to your arrival. We cannot be responsible for a positive answer for changes made in the last 48 hours. We will carry 1 suitcase and 1 hand luggage per client. Any extra baggage (eg. golf clubs, surf boards, bicycles) must be disclosed on booking. We cannot be responsible to carry any extra luggage not declared. All children and infants count towards the occupancy of the vehicle, regardless of age, and thus should be included in the designed field at the time of booking. Child seat for a child are provided by us free of charge. We strongly recommend that you advise the age of your young ones on the special requirements box at the time of the booking, so we can supply the most suitable child seat according to the child´s age. We reserve the right to decline to transport childrens due to health and safety specifications should you not advise you require booster or baby seats prior to travelling. Depending on your Faro Airport transfer destination and traffic conditions we choose the best route to your destination. We usually use the A22 highway for your commodity and safety with no extra charge. We will endeavour to arrive for collection at Faro airport on time and collect you on your return to Faro Airport at the pre arranged time, however we can not be held responsible for delays beyond our control. We will however contact you where possible in the event of any such occurrence. • the vehicle being held or delayed by a police officer or government official other circumstances affecting passenger safety. You should gave us a margin of 20 minutes should we not arrive at the pick up at the time pre arranged , this will give us adequate time to deal with unforseen circumstances which may arise. In this case, we will contact client as soon as possible. We reserve the right to depart your accomodation 20 minutes after the pre arranged pick up time should a member of your party not advise our driver of your delay or phone to the number provided on your paperwork. We will wait 1 hour after your landing time in Faro. Should there be a problem with luggage, provided you advise us by sending 1 member of your party to find us in arrivals we will be happy to wait for you until the problem is resolved. If you are travelling alone please advise by calling the number provided on your paperwork. 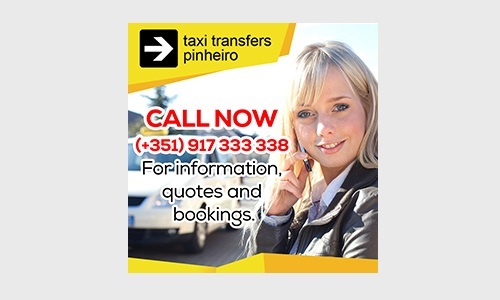 Taxi Transfers Pinheiro reserve the right to refuse to transport clients under the influence of alcohol or drugs or considered to be a risk to our driver. Smoking is not permitted in our vehicles. Consumption of food and beverages is also not permitted with the exception of water. These terms and conditions and any dispute or claim arising out of or in connection with them (including non-contractual disputes or claims) shall be governed by and construed in accordance with Portuguese law. Any complaint or request for refund must be made via contact form on our website or email to info@taxipinheiro.com within one calendar month of the return date of travel.